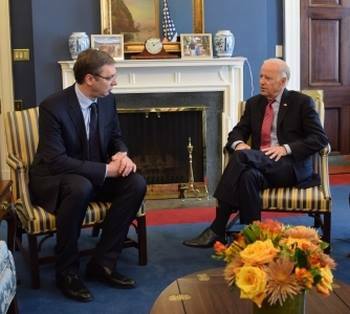 Serbian Prime Minister Aleksandar Vucic paid an official visit to the United States from 15 to 17 September 2015 and on that occasion he met with Vice-President Joseph Biden and Secretary of State John Kerry. Bilateral relations, Serbia's European path, migrant crisis, regional stability, investments of US companies in Serbia were the main topics of talks with US officials. Prime Minister Vucic said that Serbia has received support from the United States for economic and political reforms and the path towards the EU. During his visit to Washington Prime Minister Vucic met with several Congressmen: Chris Smith, Bob Corker, Edward Royce, Eliot Angel and David Sislen. At the Brookings Institute in Washington, Prime Minister Vučić gave a lecture on the topic “The Future of Serbia: Challenges and Opportunities for regional stability, reconciliation and integration”.